The much anticipated debut release on Specific Music welcomes Dmitry Molosh to the label with a two track EP. Founded by Russian DJ Yegor Tsarkov Specific Music looks to showcase the best in contemporary progressive house. Being a long time purveyor of the sound in his DJ sets I expect Yegor to build Specific into one of 2016’s best new labels. An impressive first release is certainly important and an EP from one of the underground’s best talents in Dmitry Molosh more than fits the bill. It’s a busy week for the Belarus based producer who also has a collaborative EP with Michael A due out on Genesis Music and a remix of Robert R. Hardy on Superordinate Music. 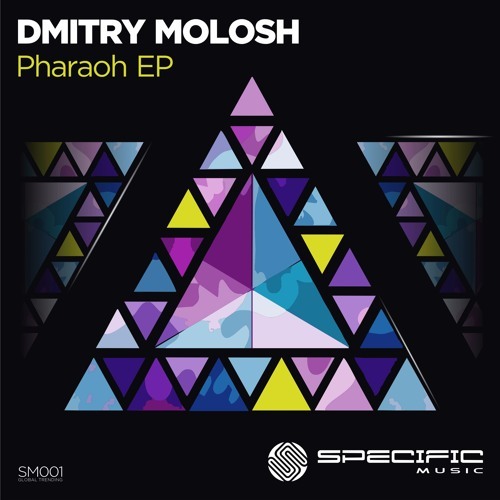 The lead track here ‘Pharaoh’ comes in as one of Dmitry’s grooviest productions to date in fact. Perfectly moulded bass stabs make for a chunky, floor friendly foundation while tough percussion and dark stabs fill the air. A mystical vocal sample adds a new dimension and carries the track into the main break. Full of ominous tones and razor sharp synths, the break does a lot to raise tension before a trail of sonic decay and vocals ultimately bring the groove back for a huge moment. Big stuff from Dmitry. The companion piece ‘Dagger’ proves to be just as deadly with its dark, driving techno sensibility. Tough beats, rough stabs and a clustered motif set the tone while a barrage of claps and fluid hypnotics drive the piece forward. The energy is electric throughout and a well played deconstruction of the groove initiates a short but deadly break. It’s unabashedly peak time and certainly one you could see Hernan Cattaneo dropping in a large room. It rounds out not only an excellent EP from Dmitry but a great debut release from Specific Music. Definitely a label to keep a close eye on as the year moves forward. Highly Recommended.